The plan for Audi to release an all-electric supercar based on the R8 is on track. Around 1,000 of these cars will become part of a test fleet that will allow Audi to assess how customers will use the e-tron and how the technology works in the real world. 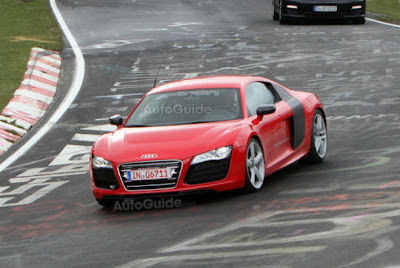 Despite the spy shot showing the car wearing the bodywork of a current generation R8, expect the e-tron to get a unique design when it does finally hit the road late in 2014, most likely inspired by the e-tron and e-tron Spyder concept cars. A kerbweight of around 1,600kg is likely, with 600kg of that thanks to the lithium-ion battery pack behind the driver. By comparison, Audi's 5.2-litre V10 engine weighs 400kg. Performance will be impressive, our sources revealed that a 0-62mph sprint in 4.8 seconds is the target, thanks to a 312bhp electric motor. Expect to pay around £150,000 when the e-tron does finally go on sale.